Travel 100% Mineral Sunscreen SPF 30. 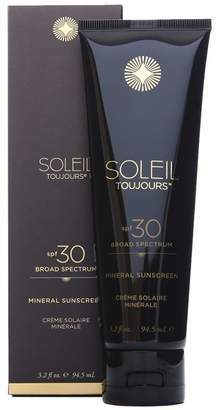 Soleil Toujours Travel 100% Mineral Sunscreen SPF 30. 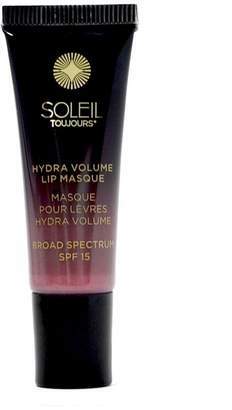 Soleil Toujours Travel 100% Mineral Sunscreen SPF 30. Elegantly formulated with natural, photostable sun protection, the Soleil Toujours 100% Mineral Sunscreen SPF 30 offers broads spectrum defense with skincare benefits. Zinc Oxide delivers effective, safe protection against UVA rays while potent antioxidants, vitamins, and botanicals moisturize, soften, and nourish the skin.. Includes the brand's proprietary EcoSunComplex - a powerful combination of Red Algae, Vitamin C Ester, Vitamin E and Bisabolol to help prevent loss of elasticity. Licorice Root Extract helps inhibit melanin production to brighten and prevent hyperpigmentation, while Ubiquinone aids in the building of collagen and elastin to reduce fine lines and wrinkles. Free of parabens, oxybenzone, retinyl palmitate, petrolatum, phthalates, sodium laurel sulfates, propylene glycol, animal ingredients or testing, and synthetic fragrances or colors. 1.2 fl oz. Apply liberally 20 minutes before sun exposure. Reapply immediately after swimming, sweating or towel drying or at least every 2 hours. Use a water resistant sunscreen if swimming or sweating. STOU-WU13. 867944000080.